Like them or not, lawyers are much-needed professionals who can help you handle important, sensitive and often complex events. Without a lawyer, it's difficult to put together a will, create business contracts or file for divorce. In recent years, online legal sites like LegalZoom.com have emerged that give you the tools to act as your very own lawyer. The sites offer simple, tailored questionnaires that run you through a series of questions, dropdowns and checkboxes. You fill it out online, pay a fee (substantially lower than any lawyer would charge) and then just wait for your documents to arrive in the mail. It's certainly faster and cheaper than hiring a lawyer, but is it better? That's what we wanted to find out. We spoke with three different attorneys, each an expert in his or her field, to get the full skinny on "going legal" online. "Absolutely not a good idea," says Julie Min Chayet, Managing Director and Trust Counsel at Fiduciary Trust Company International. In terms of a will, Chayet says there is just no way a simple online form can satisfy a client's expectations to deliver the specific type of legal document needed. From guardianship to religious upbringing to distribution of assets, every single person's situation is different. Even in the most simplistic of cases, Chayet finds fault with online legal sites. If someone is single, an only child, with both parents still alive, and no complex investments, it still isn't a good idea, she says, since having your parents inherit your assets could have a negative impact. "By your parents inheriting your assets, how would that affect them? That may not be a question you ever anticipated when you initially went on LegalZoom and did your 30 minute will. That's where your simple will turns into a much more complicated situation for your parents; it may push them into a taxable, more complicated situation." The real key, though, is the human interaction. What's missing from these online legal sites is that when you work with a lawyer face to face, there is a very real emotional connection. With all of their experience, notes Chayet, a lawyer can draw out specific priorities from the client and identify issues that may not have necessarily have been on a client's radar when they began their conversation. Steven Nadel, Partner at Seward & Kissel LLP, agrees. "The biggest danger is that it doesn't take into account emotion and relationships," he says in reference to online legal sites. "Whereas if you're talking to an attorney, the attorney will be able to sense where to go, what to push on. When it comes to family planning, you don't want to make a mistake and just check off a box and do the wrong thing because the computer didn't have the right question to ask." The major reason for using online legal sites is saving time, and more importantly money. For nominal fees of a few hundred dollars or less, people can set up their entire will in less than one hour. Spend even just one hour with a lawyer and you'll easily creep past that. Nadel offers that money shouldn't be an issue. There's no need to visit a huge expensive law firm. Instead, find a reliable solo practitioner who won't charge a significant amount. Chayet takes things a step further, stating that even spending a significant amount of money on a will right now, will save you in the long run. She points out that even if you spend $1,000 or more while your children are relatively young, you'll be getting it done correctly from the start. That will is all you'll need until the children are adults. Yet if you go with a quick online will, you may need to constantly make updates and modifications for areas you never even imagined. One area both lawyers agree on is that some basic business transactions, like setting up a simple Limited Liability Company, can be handled online. If there's no real decision making involved and it's as simple as starting a company and having a name for it, then Nadel thinks setting that up online is fine. It's when there's any opportunity to go in a variety of directions that trouble arises. "There's issues when it's not black and white," says Nadel. "The problem often times with the law, if you're buying a house, if you're setting up a will, or if you're getting a divorce, the problem is it's a lot of grey. Computers are not grey. Computers are ones and zeros. Computers don't have twos. In the world of law, there's a lot of twos." Breaking Up Is... Easy to Do? Not every lawyer is against the online legal sites. With something as emotional as divorce, you'd think individuals should avoid them at all costs. Steven Mindel, Managing Partner at Feinberg, Mindel, Brandt & Klein, believes roughly 25% to 30% of the population could do well to use a site like LegalZoom to file for their divorce. In the case of a very simple scenario, Mindel states that these types of programs can work very well for people. When it's just two adults without a lot of complexity in their marriage, they can file without issue. In fact, in some cases, doing your divorce online actually has some positive outcomes. Besides being less expensive, many times it can also be a much less contentious divorce. "You need to have a basic agreement with your spouse" says Mindel. "That means you have less wear and tear on family in terms of overall stress, and less dollars out of pocket because you're not spending money on a lawyer." For the other 70% of the population, though, Mindel warns "there's a lot that can slip through the cracks and cause lots of problems." If there's any sort of complexity in a marriage, couples should see a lawyer. If they're unsure of which option to use, Mindel suggests always taking at least a two hour initial meeting with a lawyer. It will cost you a small amount, but the lawyer will examine your case in detail and tell you whether it's worth handling yourself or seeking counsel. 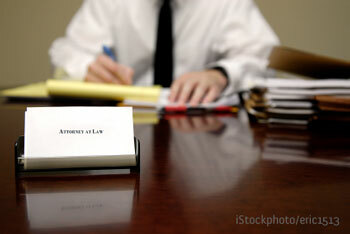 Overall, using online legal sites are certainly quicker and cheaper to use than attorneys. But in all but the most simplistic of cases, using a legal site opens the door to missing key information. In the long run, you may end up paying more than you bargained for. What else would you expect a leading trust lawyer to say? If he said anything else, he’d be a target for the rest of his life - doggedly pursued for all eternity by every other attorney who makes a dime writing form-like wills for the average joe. I got divorced about three years ago. It was a fairly straightforward situation; my ex and I had already agreed on who kept the house, who got certain bills, who had custody of our son, etc. I used LegalZoom to generate the court documents, then went to the courthouse and filed them myself. When I arrived on the day of the divorce court hearing, all of the paperwork was in order and we were able to obtain the divorce without any problem. Total cost of the divorce (LegalZoom and court filing fees)was less than $500. Before using LegalZoom, I had called a couple of attorneys to get an estimate on a standard divorce, and it would have been at least twice that amount. That having been said, I would NOT recommend it to anyone who has a less-than-amicable split with their soon-to-be ex-spouse. If there are any disputes about custody, property, assets, or any other situation that could possibly complicate the divorce process, get an attorney. I consider myself fortunate that my ex and I were able to come to a peaceable agreement; however, I have seen other friends go through some very nasty divorces that require a good lawyer in their corner. Better safe than sorry! I have used an online legal service and was totally satisfied. When I tried to put in stipulation concerning one of my son, I was immediately notified that that would not hold up in court in my state. They informed me that I could but just wanted me to be advised. I set up a Living Trust, Will & Power of Attorney. Giving thorough instruction on how to file quick claim for house to Trust etc. My son & wife went to an attorney due to children being involved but his attorney had no problem with people using online services that aren’t complicated. Ironically, I recently wrote about this issue after trying to reason with someone who was getting their legal advice for free from a secretary who works in a law office. This might be the equivalent to letting a nurse do brain surgery—after all, it’s only minor surgery, right? And think of the money you’ll save! The problem I see is that most people do not have the background and knowledge to see the “what if” situations that can develop. In a sense we often don’t know what we don’t know. Therein can lie the value of a face-to-face meeting with an attorney. We rarely make good decisions when the only criteria we apply is how much money we have to spend. There is real danger in underestimating how “simple” legal matters are. Online legal services have the ability meets legal needs that currently go unmet. Consumers have legal needs, but often can’t afford to use attorneys to take care of those needs. It’s one of the reasons we started Kunvay to help consumers navigate copyright and intellectual property easily. We don’t think it’s a question of either/or attorney/online service. We think there’s an opportunity for both. I’m a trusts and estates attorney, so I have my own biases. The real question for most people is what an online document DOESN’T ask. Would you be well-served by a trust in your will? What kind? Is your life insurance in the best tax situation? What about that potential heir with an alcohol problem? Is it fair to leave your children unequal amounts? Should you make plans (especially in this interest rate environment) outside your will? How do you properly execute a will in your state? What if you have charitable plans for your estate? There are a thousand questions that only a discussion with an attorney can answer. But as I said, I have an interest in this, and I have my biases….